-Label each box with a permanent marker. 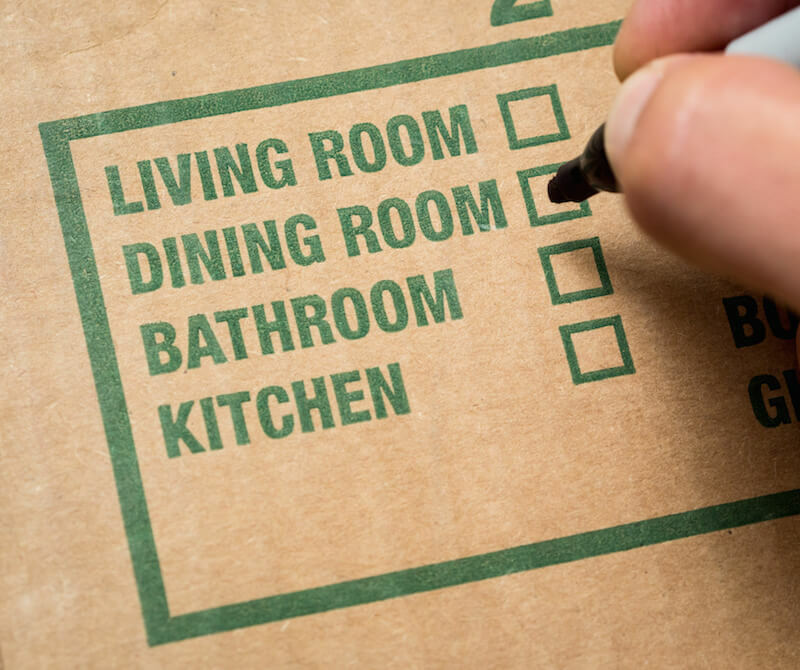 The label should tell movers where the boxes need to go in your new home. Be specific. While you’re at it, label boxes with their contents. If the contents of the box are valuable, consider being vague by just writing something like “fragile” on the box. Whether you’re moving a long or short distance, packing valuables and fragile items can be difficult. If you don’t pack them with care today, you’re going to end up with a lot of broken stuff at the end of your move. -No matter how well you think you packed, you should always get moving insurance. You never know if the truck will have to make a sudden stop, for example, or if a box mysteriously disappears along the way. The peace of mind you get from moving insurance is often worth the price on its own. -Thinking about what else you need to consider before moving? We’ve created a checklist for you. Your new home is different from your old home. You don’t need to bring everything to your new home. Your old king-sized bed might not fit in the guest bedroom, for example. Or, your TV may be too small for your new living room. Consider the measurements of your new home before you move. Then, sell anything you won’t need. You can make money by selling old furniture. Plus, you free up space in your moving truck and avoid extra packing stress. Not sure of what to get rid of? Bustle has you covered. Packing is the most stressful part of moving. Unless you’re a professional mover, you probably don’t know how to safely pack your possession into the back of a truck. That’s why professional movers are a smart investment. You protect your possessions. You minimize stress. And, you get it all at a cost that’s not much higher than renting your own moving truck. If you’re moving away from Sacramento, get a free moving quote from Sacramento moving company Fuller Moving Services and enjoy fast service, honest rates, and a stress-free moving process anywhere you need to go.